Coming from a long line of highly respected vampires, Upir knew that going to Neewollah, the Monster Mausoleum, would help him live up to his family’s reputation, but he never anticipated the terrifying turn his stay there would take. Upon entering, Upir befriends several strange creatures and their nights soon become treacherous when they have to dodge flying skulls whose hollow eye sockets shimmer with bright blue lights, avoid huge plants with tongue-like tentacles that devour young monsters, and run from a mad scientist who loves to use the monster students in his experiments. Most of all, they try to stay away from Muriel, an ill-tempered, nasty gorgon girl with slithering snakes for hair. She is the leader of three cantankerous monsters that follow her every command. Her group is bent on destroying Upir and his gang. Without warning the young monsters find themselves entangled in a plot to destroy the Monster race. Will they escape the clutches of this horrifying villain and alert the Monster world, or will they become his loyal soldiers? “Yeah, you kid!” A monster with an enormous bumpy head, bulbous nose and winged ears pointed at the vampire. A single tooth protruded from the troll’s lower lip as he gaped at Upir. A wolf-boy, his grin revealing sharp pointy teeth, was with the group. His eyes had a hungry look to them. Upir swallowed and tried to sound calm. “Yeah, what do you want?” he asked. A green goblin boy, a skateboard under one arm, shoved his way between the other two and glared at Upir. “We’re the welcoming committee around here,” he said sarcastically. Upir doubted that. “Okay,” he said slowly. Upir started to shake his head, but before he could speak, the gorgon stuck out her hand. “Glad to have you aboard,” she said. Upir smiled. “Serious?” he asked. He didn’t like the fact that, once again, he’d been befriended because of his name. But to run with the in-crowd, he could deal with that. “Thanks,” he said. “Yeah, see ya around,” Groks said hitting Upir on the back so hard that he stumbled into the wall. Raff snickered and Gordon hooted. Muriel called out another “Shut up!” before they were out of sight. Upir pushed open the creaky door and entered a dark, stone-like cave. in the air. Upir saw the rock wall through the boy’s glowing form. Upir smiled back. “I’m Upir,” he replied, glad he hadn’t offered his last name. He knew everyone would find out soon enough. But until then, maybe he’d have a chance to make friends on his own. Gusty moved, seeping in and out of form like a genie near the mouth of its bottle. Upir blinked a few times, not sure the boy was really there. We’re on our way to be published! 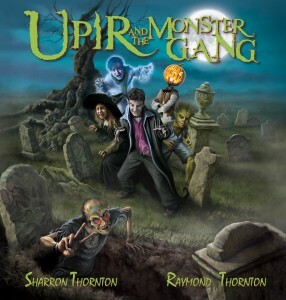 My name is Sharron Thornton and I wrote a children’s novel entitled Upir and the Monster Gang. The book has 60 full page, full colored illustrations which were done by my son, Raymond Thornton. We have chosen to use an online, crowdfunding site called Kickstarter to begin this amazing venture. Beginning October 1st and running through November 16th we are doing a pre-launch, first edition sale of our book. 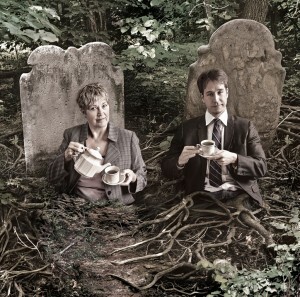 Attached to this email is a link to our Kickstarter page. There you can watch our video and see some of the Upir and the Monster Gang products we have listed. One of the great things about Kickstarter is that it’s like a grassroots campaign that spreads and then builds momentum. 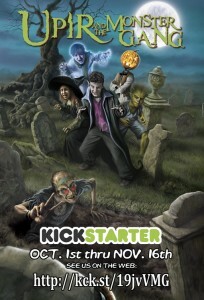 After the Kickstarter we have marketing and distribution lined up to take Upir and the Monster Gang to the next level, but we need your help getting it started. Please share our Kickstarter page with your family and friends on your email lists, social media and any other networks you may have and then ask them to share it also. As a child of the 1970s I grew up on reruns of The Munsters and The Addams Family, as well as those classic horror movies – Boris Karloff in Frankenstein and Bela Lugosi in Dracula. As I got older my love of cinematic horror only grew, and my geek-girl tendencies meant that even though I’m older than the target demographic I embraced everything from The Monster Squad (1987) to Buffy the Vampire Slayer, and fell in love with Being Human. What could be better, then, than to help introduce a new series aimed at tweens that is from the monsters’ point of view? Sharron Thornton taught elementary school for 35 ½ years. She felt it was important that her students developed a love for reading. One of the special times of each school day was right after lunch recess when she read a novel to her children. It didn’t take the kids long to get quiet and settle down for they were anxious to hear where the next chapter would take them. Sharron soon realized that books were doors to imagination for all children at all levels of learning. When she retired, Sharron missed all of those young faces. She missed their emotional involvement with the characters and story lines from the books she read to them. So, she decided to work on an illustrated novel with her son Raymond who is an artist. Thus, Upir and the Monster Gang was born, a world of monsters, mad scientists, zombies, ghosts, vampires and all things that live in the night. Sharron has been writing for almost a decade. Besides the Upir series, she is working on several other children’s novels. Raymond Thornton is an artist from Northwest Indiana. At the age of fifteen he started his fine art training at the Drisi Studio Academy of Fine Art. For five years he studied the finer points of painting and drawing. He then continued his studies at Columbia College and the American Academy of Art in Chicago where he received a degree in fine art. Raymond’s oil paintings have been exhibited across the country. He has received many awards including the gold medal at the 96th annual Allied Artists of America Exhibition and an award of excellence at the 2012 Oil Painters of America Eastern Exhibition. He has illustrated many national ad campaigns. Most recently he illustrated and co-created with author Sharron Thornton, his mother, Upir and the Monster Gang. It is an illustrated novel about a young vampire and his monster friends which features over 60 full colored illustrations.